Product #1201 | SKU 322RC2 | 0.0 (no ratings yet) Thanks for your rating! 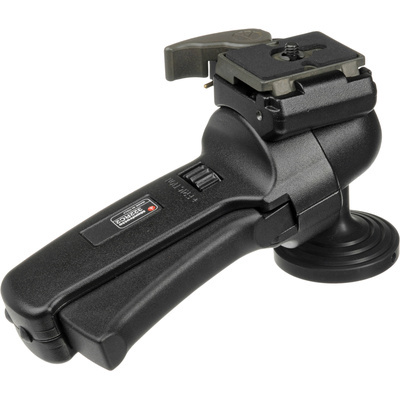 The Manfrotto 322RC2 Grip Action Ball Head offers the versatility of a ball head, with true ergonomic control. The 322RC2 is unique in that it allows the camera mounting assembly to be positioned for left or right hand operation, in horizontal or vertical position, and in addition, will allow you to unblock, move, position and lock your camera with one hand in one position. This is due to the revolutionary design of its grip handle which incorporates the ball lock lever. The very act of taking your hand away from the grip locks the head into position, which eliminates the extra step of having to tighten a knob or lever before being ready to shoot. The tension of the ball can be adjusted to accommodate the load weight. This head is not suitable for continuous tracking of moving subjects, it is not practical since one must always grip the lever to release the ball and thus your hand would tire after prolonged use. An ideal head for action or wedding and portrait photographers.